The blessing of grapes, as well as other fruits and vegetables on this day is the most beautiful and adequate sign of the final transfiguration of all things in Christ. It signifies the ultimate flowering and fruitfulness of all creation in the paradise of God’s unending Kingdom of Life where all will he transformed by the glory of the Lord. We must not forget that the Church was presented once as a “vine”. So, [the] Church blesses the first fruits of vine giving a “theological” meaning to farmer’s work. 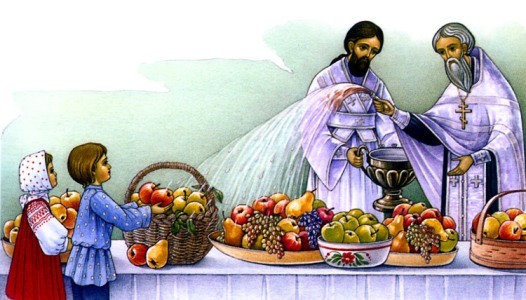 In the first centuries of Christianity, the faithful brought forth to the temple the fruit and crops of the new harvest: bread, wine, oil, incense, wax, honey etc. Of all these offerings, only bread, wine, incense, oil and wax were taken to the altar, while the rest was used for the needs of the clergy and the poor whom the church was caring for. These offerings were to express gratitude to God for all goods, but at the same time help servants of God and people in need. Until today, consecration of bread and wine, eggs and milk and other food has been kept in consecration of artos in the church and meals at home on Easter. Consecration of flowers and tree branches is performed now on Palm Sunday, the days of the Holy Trinity and Exaltation of the Cross, and on Sunday of the week of the Veneration of the Cross. Rice with rasins and honey are used as offerings in services for the dead and remembrance repast. Prosphoros are brought forth for proskomide everywhere even today.